We had heard so many good things about the Greenwich Wine + Food Festival, so this year we were SO excited to be able to attend and see what it was all about. We're happy to report that the event sponsored by Serendipity Magazine to benefit The Hole In The Wall Gang Camp, totally lived up to the hype. 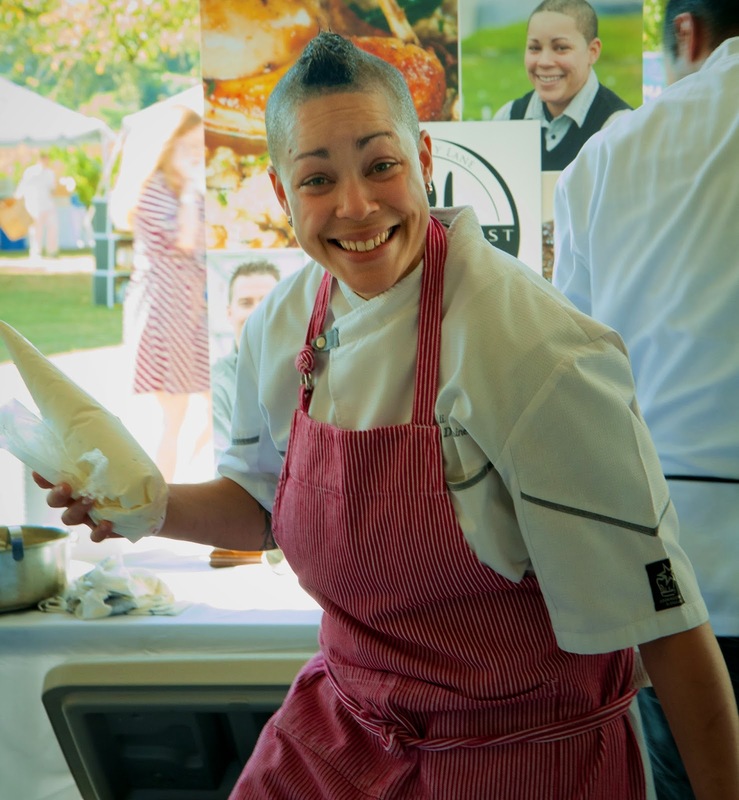 Not only was it a beautiful, sunny Saturday down by the water in Greenwich, but there was a killer lineup of food, beverages, celebrities and demos. Seriously, if you paced yourself you could truly spend the entire day wandering, eating and drinking. We'll give you a few personal highlights, but be sure to check out our complete photo album for all the day's goodness. 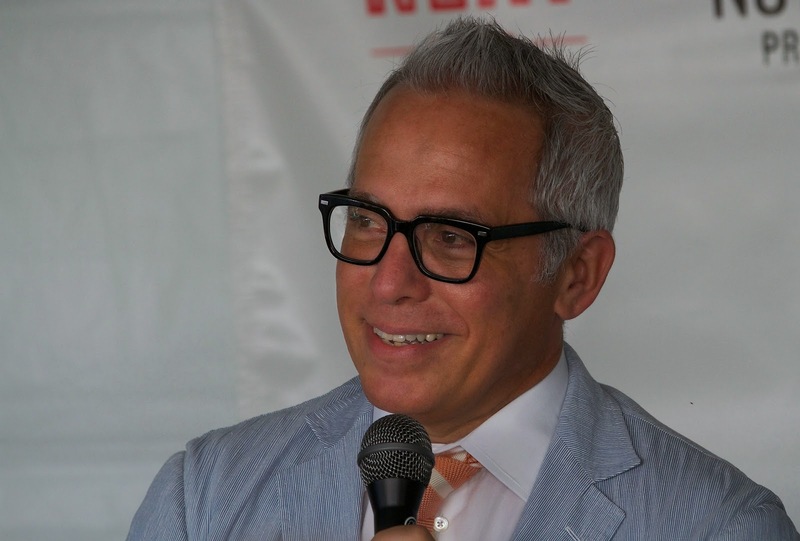 CT Bites sponsored a blogger lounge where all us crazy food writers could recharge our devices, along with ourselves thanks to coffee by NEAT. 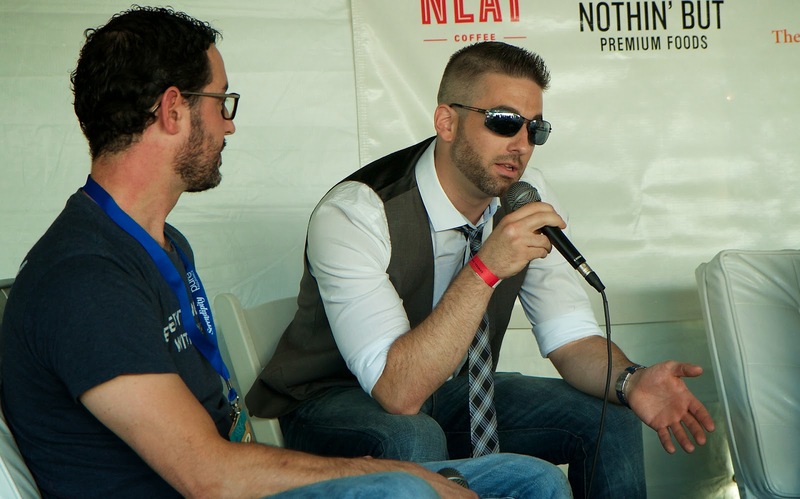 Chef Matt Storch (Match Restaurant) was the moderator for a series of interviews and food chats throughout the day. 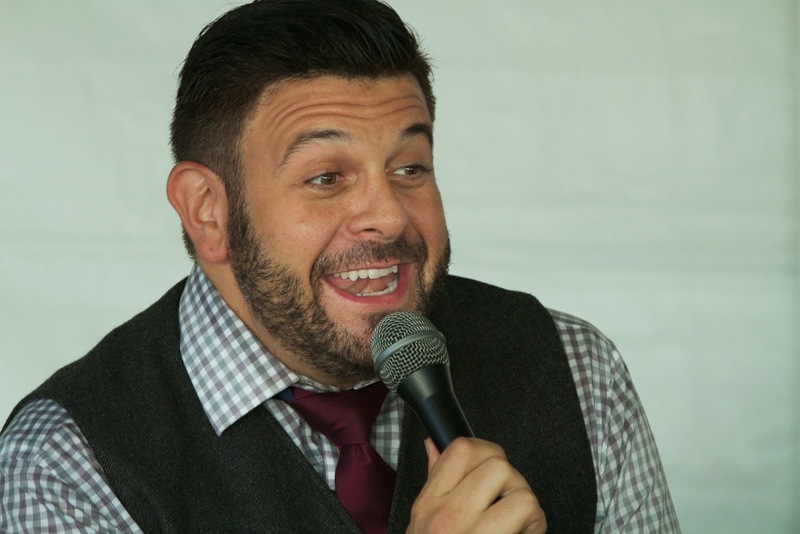 We got there just in time to catch a bit with Adam Richman. This guy is wealth of food trivia. He fell in love with food in France. Thinks pasta is a way to capture the flavors of this "cusp season." Essential kitchen items include a dutch oven, 4-5 knives (paring, fish, chef, serrated and carving), 2-3 14 inch skillets, and a 14-15 quart pot. It's worth investing in a good pot because it will last forever. Later in the day we listened to Adam Patrick (Match Restaurant), Jeff Marron (The Whelk, leFarm and Kawa Ni) and Gretchen Thomas (Barteca) talk cocktails. They all agreed that people should get the same quality of ingredients in their drinks that they have come to expect in their food. The beauty was that the main culinary tent ran most of the day, then by 3pm most of the main tent packed it in while the BBQ and burger vendors started up. Then, by 6pm food trucks opened to take hungry people through the night. In other words, there were many wonderful bites, there's really no way to write about them all. So I offer just a few tasty morsels. 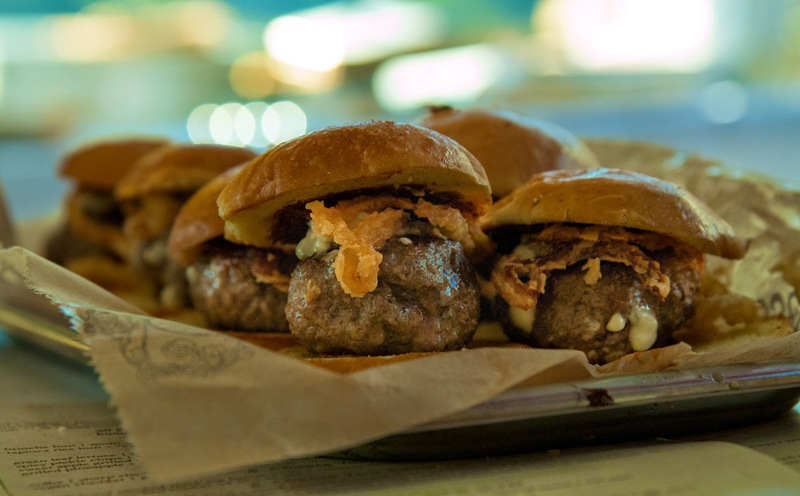 When it came to burgers we really enjoyed the earthy flavor of the elk sliders by Bareburger. We totally need to stop in to the Ridgefield location and feast on some full-sized burgers. We were so happy to see a restaurant from our 'hood representing at the festival. 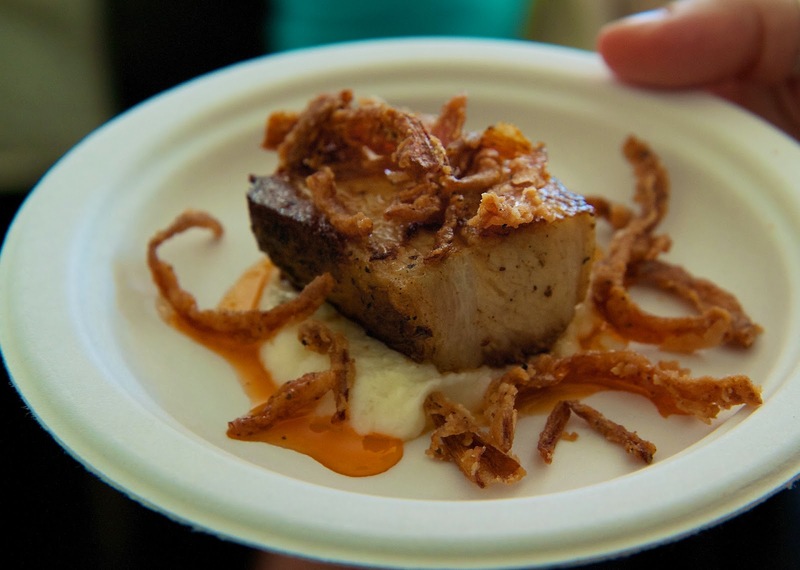 Mezon in Danbury was serving up samples of pork belly atop mashed cauliflower with crispy shallots. It was amazing. Sometimes simple is just as delicious as something complicated. 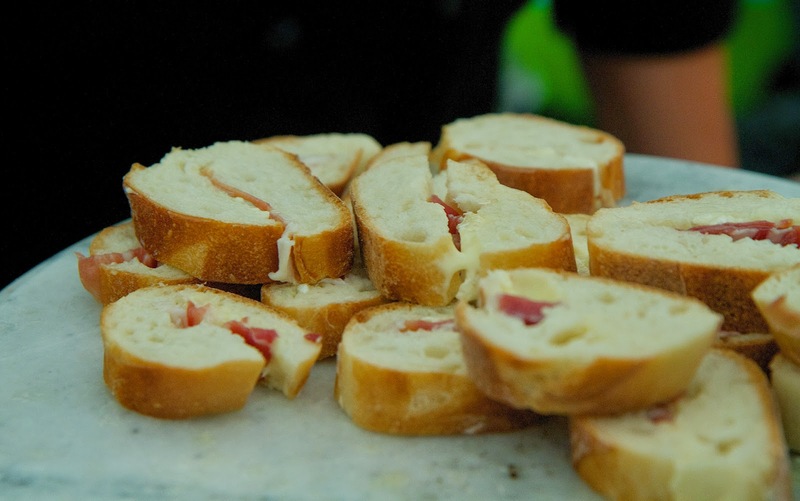 No better example of this were the sandwich slices by Fairfield Cheese Co featuring thinly sliced prosciutto and brie on buttered bread. 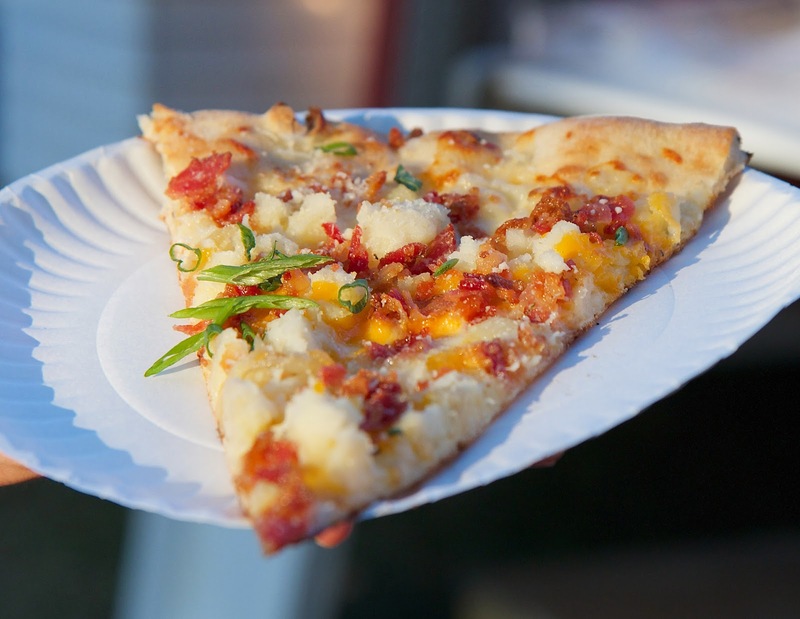 We rounded out our time with a big 'ol slice from Fire Engine Pizza Co. It was loaded with mashed potato, cheese and bacon. If that's not perfect after a day of sun and drinking I don't know what is. The crust was pretty thin yet was able to deftly handle the heavy set of toppings. And of course, we had to get a little something sweet. Tea-rrific Ice Cream out of Norwalk was perfect. 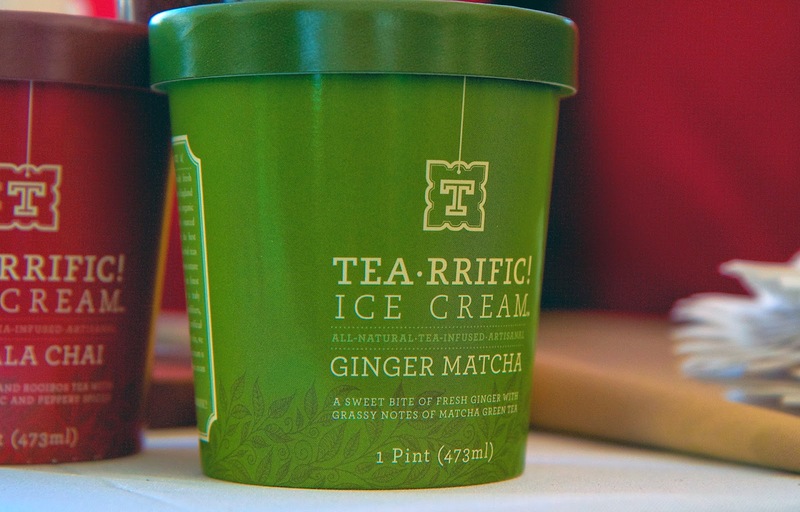 I love the Ginger Matcha flavor. It has a spicy ginger punch with a gentle sweet. I plan on picking up a pint of this goodness at Whole Foods asap. There was a full line up of tasty beverages to sample from cocktails to wine to beer. 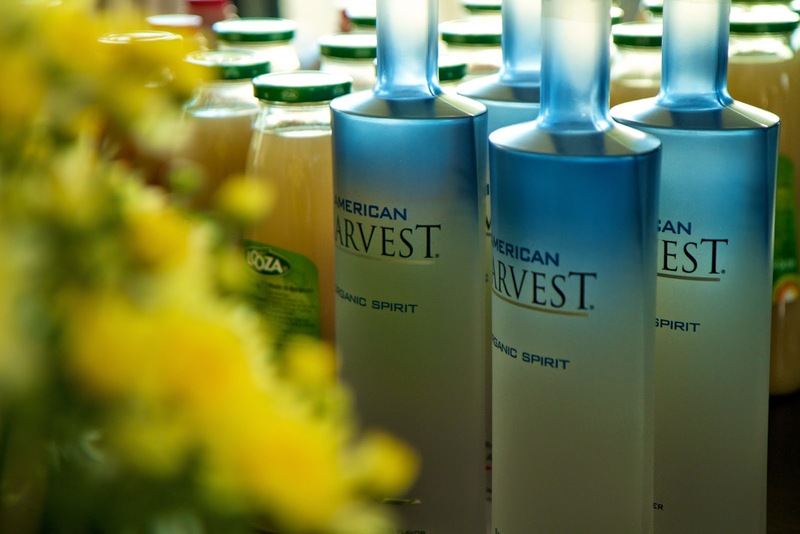 American Harvest Organic Vodka was offering up a taste of two cocktails perfect for Fall. The Big Apple was made with American Harvest Organic Vodka and fresh apple cider. The Pearfection was made with American Harvest Organic Vodka, pear juice and vanilla beans. For wine, I was intrigued by the concept behind 90+ Cellars. 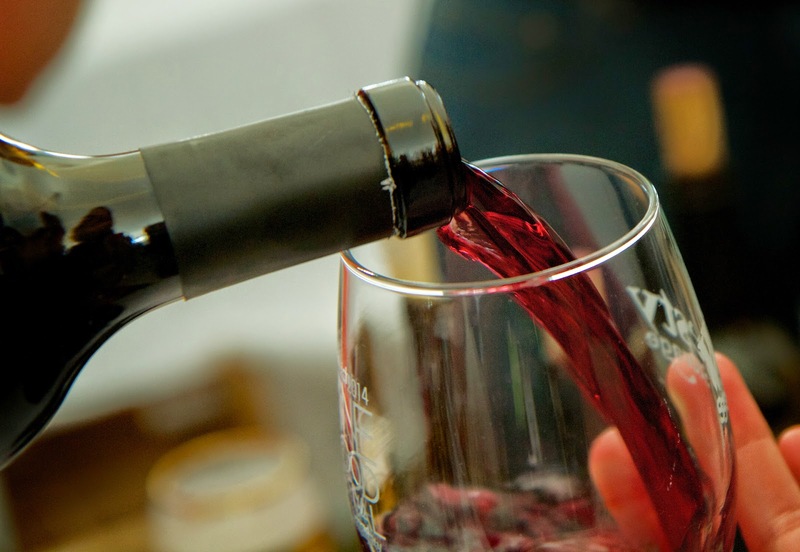 They basically partner with highly respected wineries around the globe, who are willing to put the 90+ Cellars label on their wine, and then 90 Cellars will sell it for less. Quality wine that costs less ... I'll drink to that. 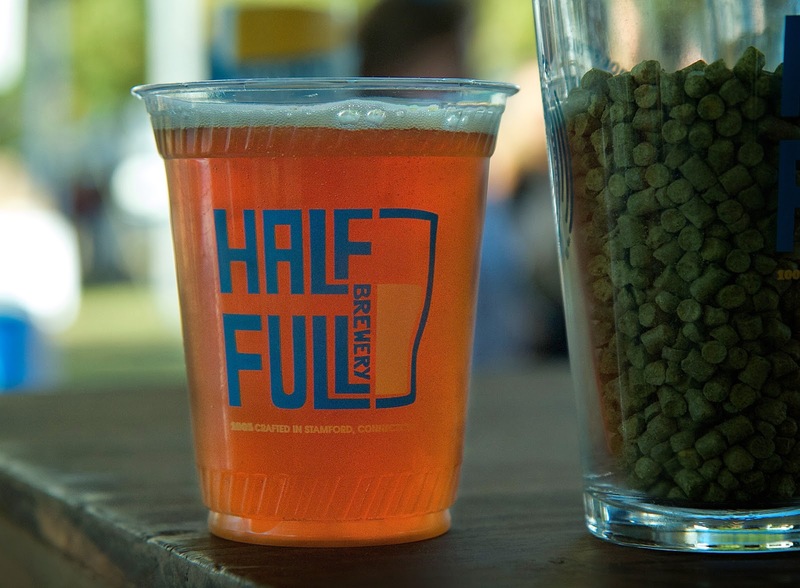 One great seasonal brew for the day was the Pumpkin Ale by Hall Full Brewery. I don't like overly pumpkin-flavored beers. This one was reminiscent of pumpkin pie, with flavors more about the spices used in pie like cinnamon and clove. It was the perfect way to wash down some BBQ from Bobby Q's and Dinosaur BBQ. 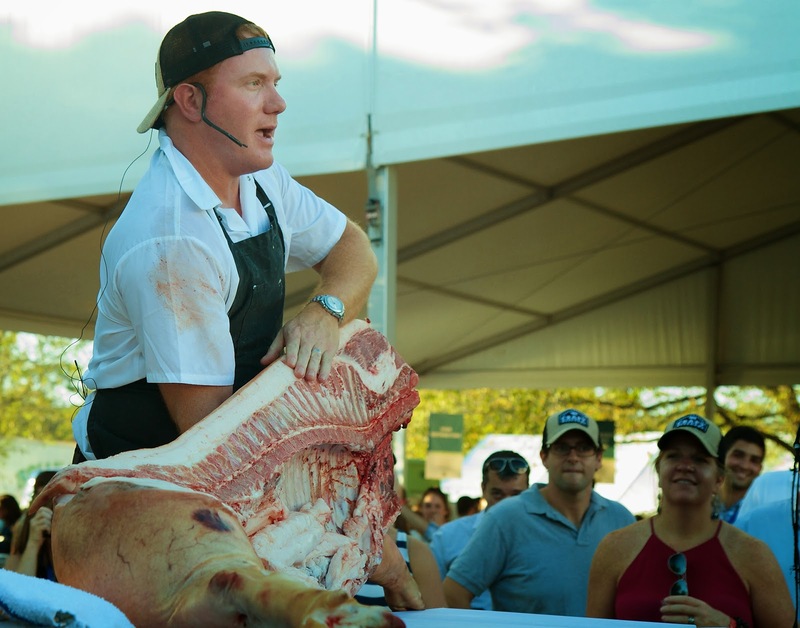 We just happened to be walking by the Pitmaster area, when we saw Ryan Fibiger of Saugatuck Craft Butchery demonstrating how to break down a half a pig. It was so cool to watch and learn how to get all the different cuts. It was super interesting to see him in action. 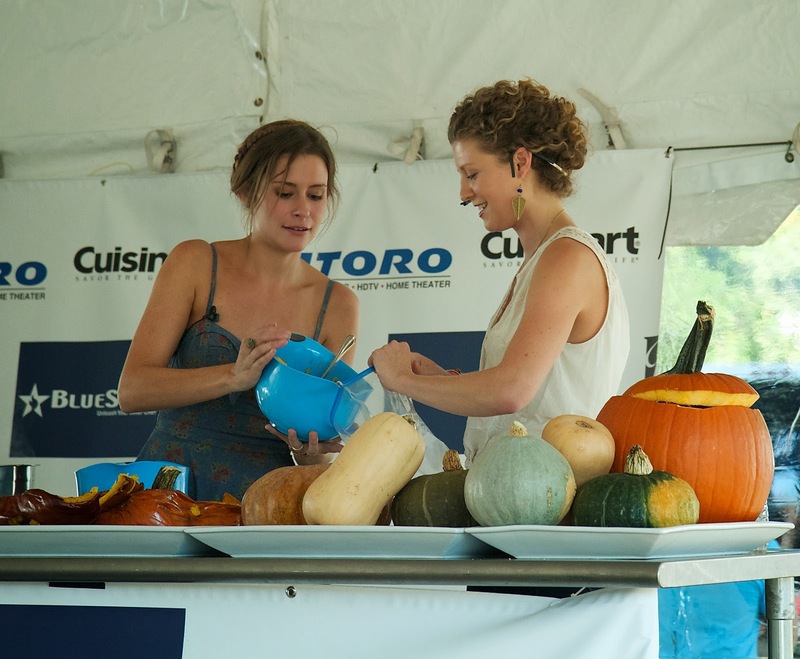 We also caught the tale end of a demo by Emma Frisch and Nicole Gaffney about how to use a pumpkin, inside and out. They made a pumpkin, apple and sage crostini and spicy pumpkin coconut soup. Perfect recipes for Fall. We just want to give a special thanks to Serendipity Magazine and Shelley from Splash PR for inviting us. Needless to say, we can't wait until next year's event!